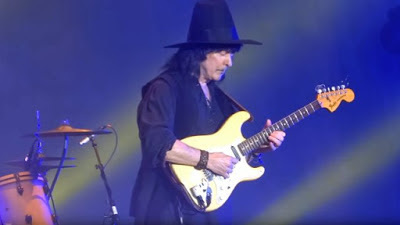 Late last year, Ritchie Blackmore announced plans to return to the rock stage in 2016 for the first time in two decades with a series of shows featuring a revamped Rainbow lineup. Having left rock behind in the 90s, the Deep Purple legend launched a medieval folk band called Blackmore’s Night in 1997 alongside then-girlfriend and now wife Candice Night. The extended Rainbow family began 2016 with sad news at the loss of former bassist Jimmy Bain, who passed away from undiagnosed lung cancer and complications from pneumonia at the age of 68 on January 23 while on Def Leppard's "Hysteria On The High Seas" cruise where he was to perform with the Ronnie James Dio-centered band Last In Line. In February, Blackmore underwent surgery to address an excess of uric acid buildup in his finger joint, which sidelined him from playing/rehearsing for about a month. March saw the guitarist being sued by Italian label Frontiers Records over a failed 2015 project by Blackmore’s Night. The suit alleges the guitarist blew off promotion commitments in support of the band’s 10th album, “All Our Yesterdays”, which contributed to poor sales. Blackmore was among the members of Deep Purple inducted into the 2016 Rock And Roll Hall Of Fame during an April 8 ceremony in New York, where the band was honored alongside Cheap Trick, Steve Miller, Chicago and N.W.A. While the guitarist did not attend the ceremony following word that the present day lineup of the group refused to perform with former members at the event, he did acknowledge his appreciation for the honor a few days later. Following the Rock Hall induction, Rainbow released “Monsters Of Rock - Live At Donington 1980”, which captured the last performance of the lineup of Blackmore, keyboardist Don Airey, bassist Roger Glover, vocalist Graham Bonnet and drummer Cozy Powell as they headlined the first rock festival ever staged at Castle Donington. In June, Blackmore hit the stage at a pair of Monsters Of Rock festivals in Loreley and Bietigheim-Bissingen, Germany and a headline show in the UK, where he was joined by a Rainbow lineup that included Lords Of Black singer Ronnie Romero, Stratovarius keyboardist Jens Johansson, Blackmore’s Night drummer David Keith and bassist Bob Nouveau. The festival appearances were captured for a November DVD and Blu-ray release, “Memories In Rock - Live In Germany”, which delivered a mix of classic tracks by Rainbow and Deep Purple. Blackmore ended 2016 by announcing Rainbow will return in 2017 for a four-date UK tour in June.